And this isn’t your average PC either. 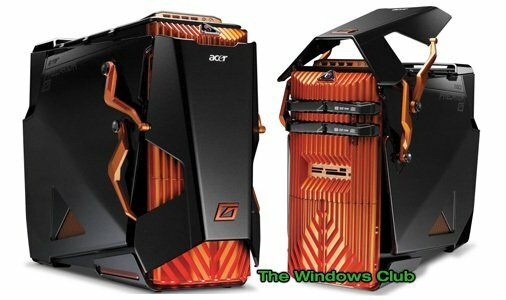 Acer, the world’s second largest vendor in the computer market, has almost outdone themselves with this new beast. Labeled the AG7750-U2222, this machine comes out armed with an Intel Core i7 930 quad-core processor, NVIDIA GeForce GTX470 graphics with 3-way SLI support, a mouth dropping 12GB DDR3 memory, 1.5 TB Hot Swap Hard Drive with 3 extra Hot Swap cages, multi-in-one card reader and an optical drive. For the serious gamers always looking to expand, the Predator can be easily expanded with an available 5.25-inch optical drive bay and a variety of open PCI Express slots, including two PCI Express x16, two PCI Express x1, one PCI Express x8 and a standard PCI. The system also offers a ton of connectivity options including 11 USB 2.0 ports (five in front, six in back), IEEE 1394, two eSATA ports, two Ethernet ports, two DVI-D ports (up to six with three graphics cards), a TV-out port, six audio jacks and various others. Starting price is $1,999.00 and is now available at all retail stores that carry the Acer Brand. More info on the Predator, view the Acer Press Release.